 Mouse anti Human HLA DR antibody, clone HL-39 recognizes HLA DR which is an MHC class II cell surface receptor expressed primarily on antigen presenting cells such as B lymphocytes, monocytes, macrophages and activated T lymphocytes. Mouse anti Human HLA DR antibody, clone HL-39 recognizes a determinant that is dependant upon the association of both the alpha and beta chains of HLA DR.
Raji Burkitt lymphoma cell line. Horejsí, V. et al. (1986) Characterization of seven new monoclonal antibodies against human DR, DR + DP and DQ1 + DQ3 antigens. Tissue Antigens. 28 (5): 288-97. Philippidis, P. et al. (2010) Anti-inflammatory haemoglobin scavenging monocytes are induced following coronary artery bypass surgery. Eur J Cardiothorac Surg. 37: 1360-6.